Note: this tour, led by Steve Baskauf, originally took place on Sunday, 12 Aug 2007. However, with these instructions it can be self-guided. 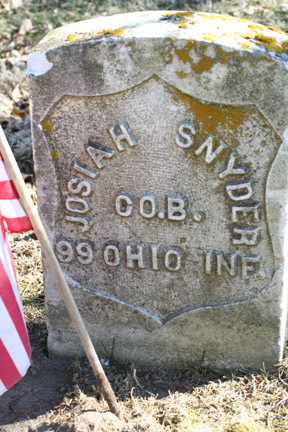 This tour focuses on places important in Bassett, Edgecomb, and Snyder history in Allen County and on cemeteries where early family members are buried. 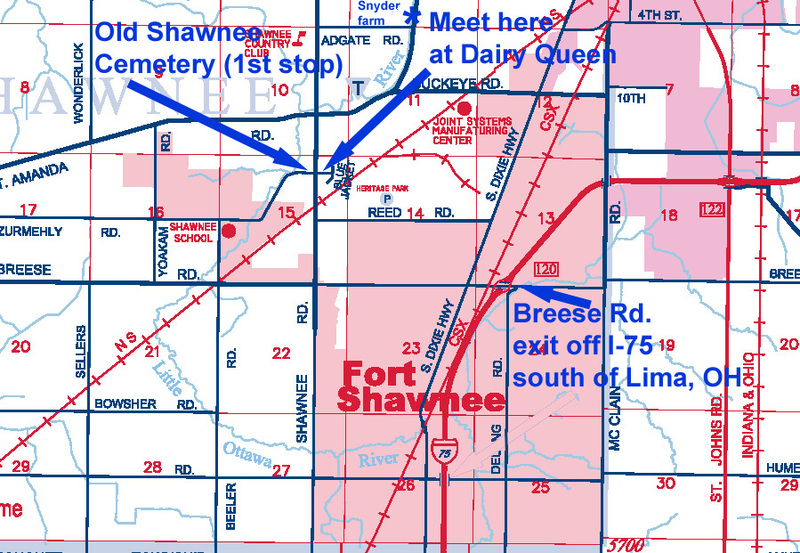 The tour will starts in the old Shawnee Cemetery on Zurmehly Rd near where it T's into Shawnee Road. 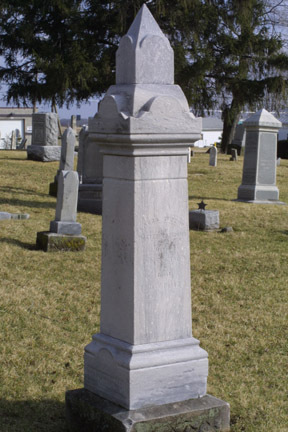 The cemetery is behind the Shawnee United Methodist Church. The address of the Dairy Queen across Shawnee Rd. 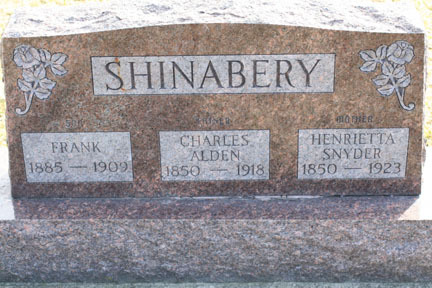 from the cemetery is 2805 Shawnee Rd. if you want to use its Mapquest location to get directions. 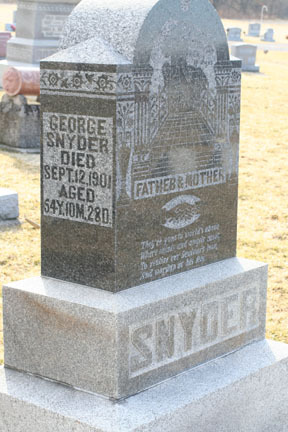 There are only three graves (all Snyder) at one location in the cemetery, so if you wish, you can skip that cemetery and just visit the Bath/Beaverdam locations on the second map. Stop 1. 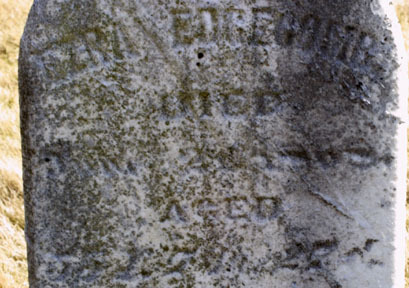 Old Shawnee Cemetery. In 1856, Peter Snyder sold his farm in Bath Township and moved to Shawnee Township where his family lived along the Ottawa River (see map above). 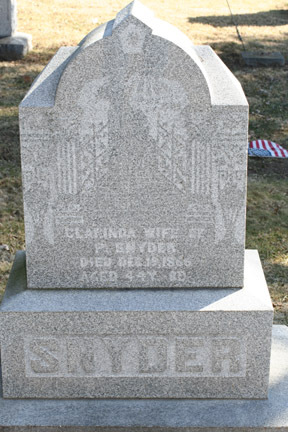 In 1862, the oldest two sons of Peter and Clarinda died in the Civil War and were buried in the Shawnee Cemetery. 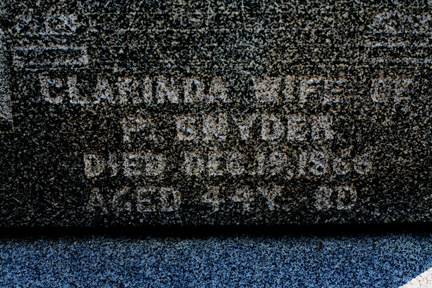 The family moved back to Bath Township that year, but when Clarinda died in 1866, she was buried in an unmarked grave next to her sons. 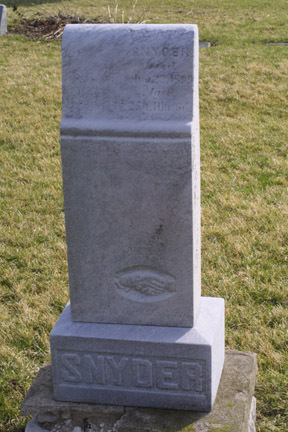 After the death of Peter in 1900 and his son George in 1901, markers of the same design were placed on their graves as well as Clarinda's. From here take Shawnee Rd. south to Breese Rd. Turn left and get on Interstate 75 northbound. Get off at the Bluelick Rd. exit and go left (west). Turn right at the first road (Wolfe). There is little traffic on this road so you can probably pull over at the side of the road after it bends to the left to read about the second stop. If there are too many cars or too much traffic, go directly on to the third stop. Stop 2. 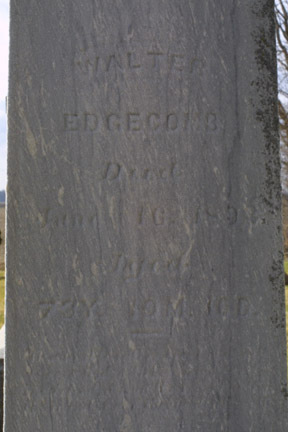 Edgecomb homestead, 1832. To the west of this point was the place where Uriah Edgecomb settled with his family in 1831 or 1832. 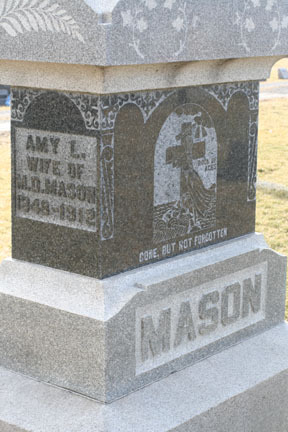 He was the first member of our families to move to Allen County from Trumbull County, OH. 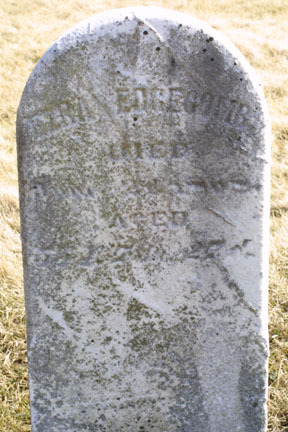 He was also one of the early settlers of Bath Twp., which was first settled by whites only five years earlier. 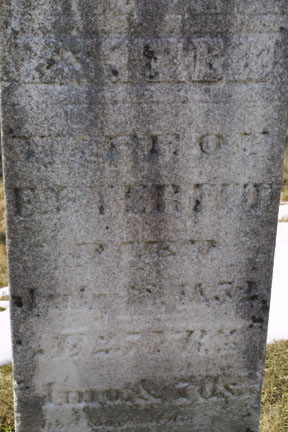 Uriah bought 80 acres in 1832 and his sons Ezra, Lansil, and Robert bought adjacent land from 1833-35. To end up on the proper side of the road at the next stop, we will turn right on Sugar Creek Rd. and go to Thayer Rd. Turn left on Thayer Rd. The intersection of Thayer Rd. and State Rd. is the original location of the Sugar Creek Disciples Church. Nearly all of the early generations of Bassitts, Edgecombs, and Lewis's attended this church. Its meetinghouse, built in 1840 was the first church built in Bath Township. The congregation later moved to Beaverdam, where it became the Beaverdam Disciples of Christ Church. Turn left on State Rd. and after one mile turn left on Wolfe Rd. The next stop is on the right - pull over along the side of the road. 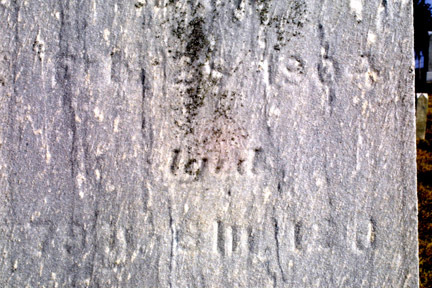 The back row of the Sproat (Wolfe Rd.) 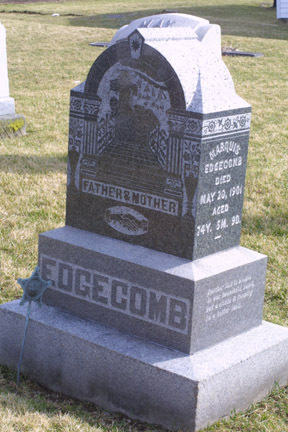 Cemetery contains the graves of descendants of the Edgecomb, Doud, and families that immigrated from Trumbull County, Ohio. 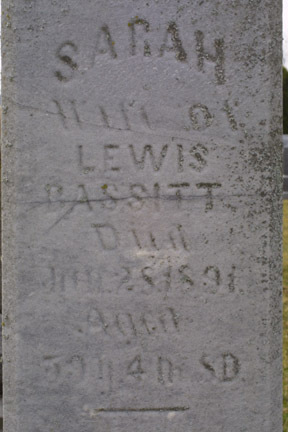 The nearest standing stone is Samuel Bassitt's. 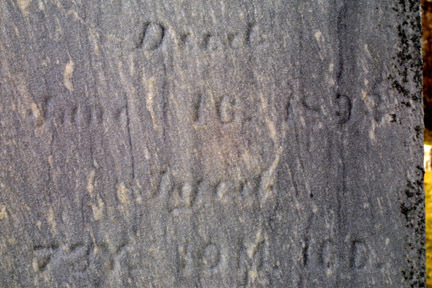 In 1975, the cemetery was a lonely spot in the middle of farmland. 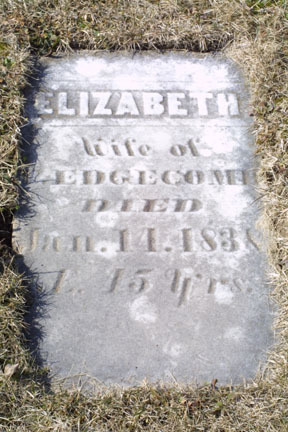 Betsy Edgecomb's tombstone had sunk halfway into the ground. 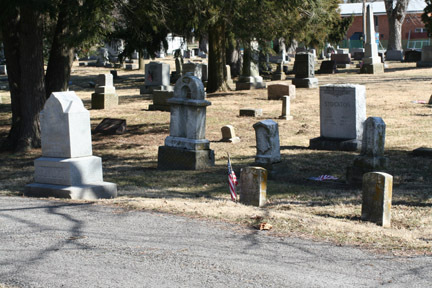 In 2007, the cemetery was in the middle suburban houses. 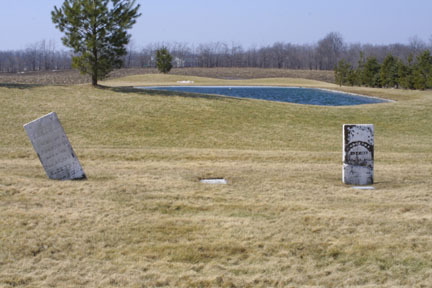 One house and pond was built directly behind the cemetery. 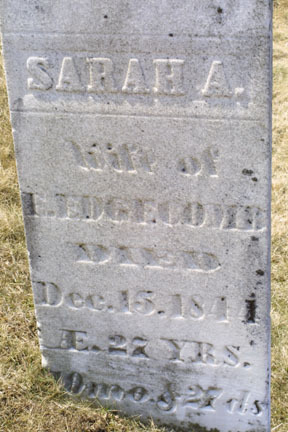 Sara Edgecomb's tombstone was leaning heavily and Betsy's tombstone was lying on the ground. 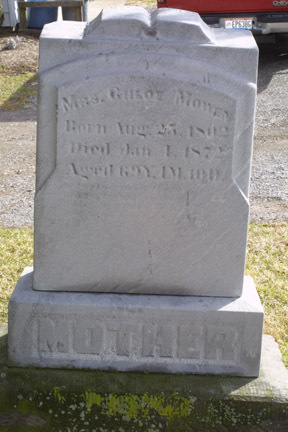 Infant children of Mary (Olmstead) and Alexander Allison, Jr.
After leaving the cemetery, turn right on the first road (Sugar Creek Rd.). The next stop is on the left. Stop 4. 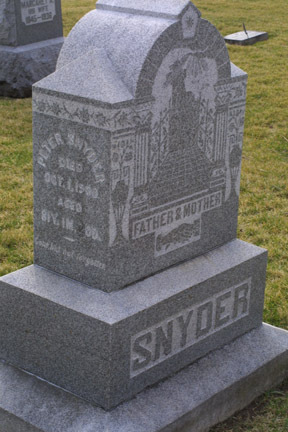 Snyder homestead. 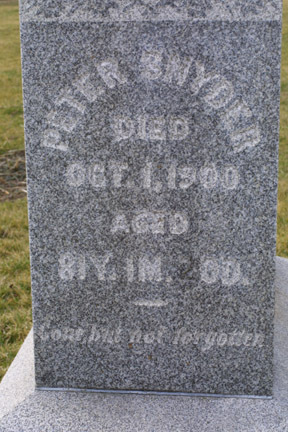 After Peter Snyder moved back to Bath Twp. in 1862, he bought this farm. 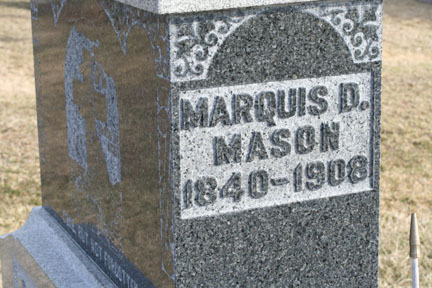 He lived there with his family until 1875. At that time, he moved to a farm on the Dixie Hwy. 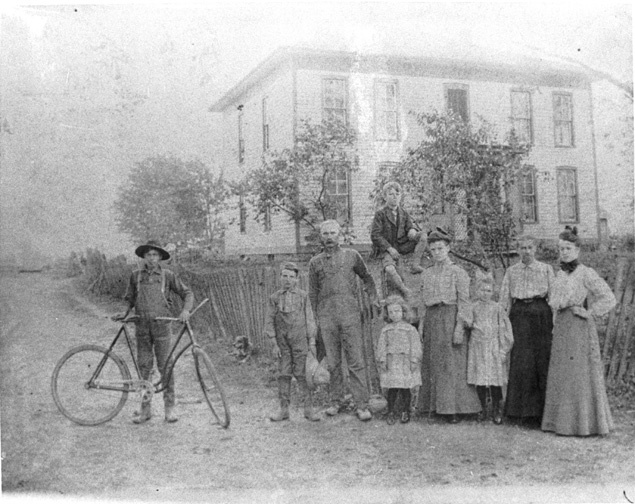 and his son George lived there (children pictured above) until his death in 1901 (approximately the time this picture was taken). Later, George's daughter, Alma and her husband Harold Vore lived in the house from about 1925 to 1942. Follow Sugar Creek Rd. until it T's with Slabtown and turn left. At the corner of Slabtown and Bluelick Rds. is the crossroads known as "Bluelick". This place was the location of the community post office in the second half of the 1800's. A small store and a one-room school bearing the same name were also located there. Turn right on Bluelick Rd. 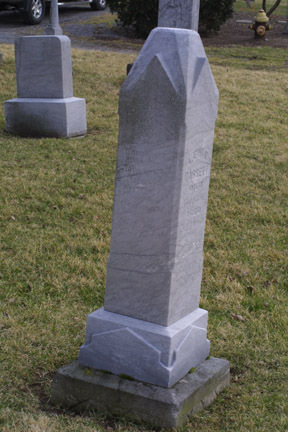 and drive into the cemetery immediately on your left. Get back onto Bluelick Rd. and go east (right) until you pass "5 points" (Dixie Hwy. and Hadsell Rd.). If it is not too muddy, you can turn right onto the lane of Jim Bassett's farm to stop and read about the next location. Stop 6. "Lordstown" community, 1836 to 1850's. 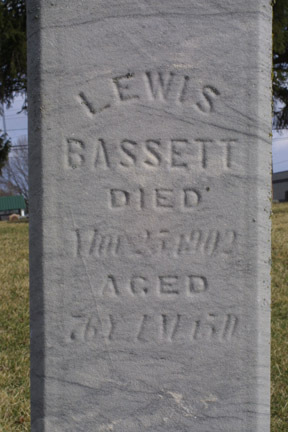 In 1836, Samuel and Elsie (Lewis) Bassitt moved to the farm that they bought near here in 1834. At about the same time or soon after, Elsie's brother, Jonathan and his family moved to the farm where we are standing. 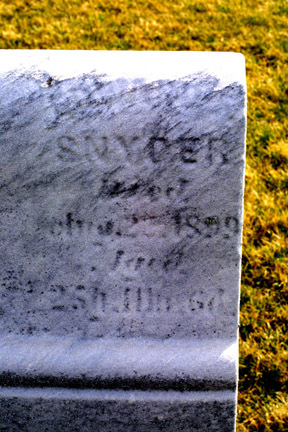 Also near by was the farm of Lorenzo Snyder, brother of our Peter Snyder, who may have lived there when he came to Bath Twp. in 1836. 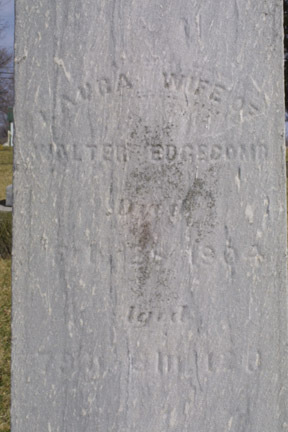 From about 1845 to about 1856, much of the Uriah Edgecomb's family lived within a mile of this spot, including Uriah, his sons Ezra, Walter, and Robert, and his daughter Clarinda Snyder along with their families. 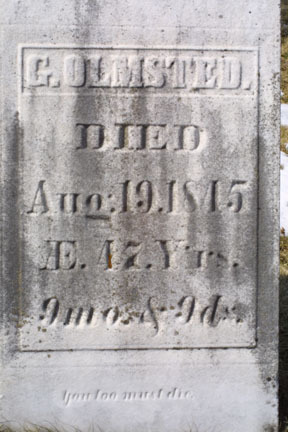 Also living nearby were Samuel and Elsie Bassett, Peleg Lewis (son of Jonathan, nephew of Elsie and brother-in-law of Robert Edgecomb), and Phineas Edgecomb, nephew of Uriah, Alexander and Mary (Olmstead) Allison (niece of Uriah), and Elias and Esther (Olmstead) Everett (another niece of Uriah). 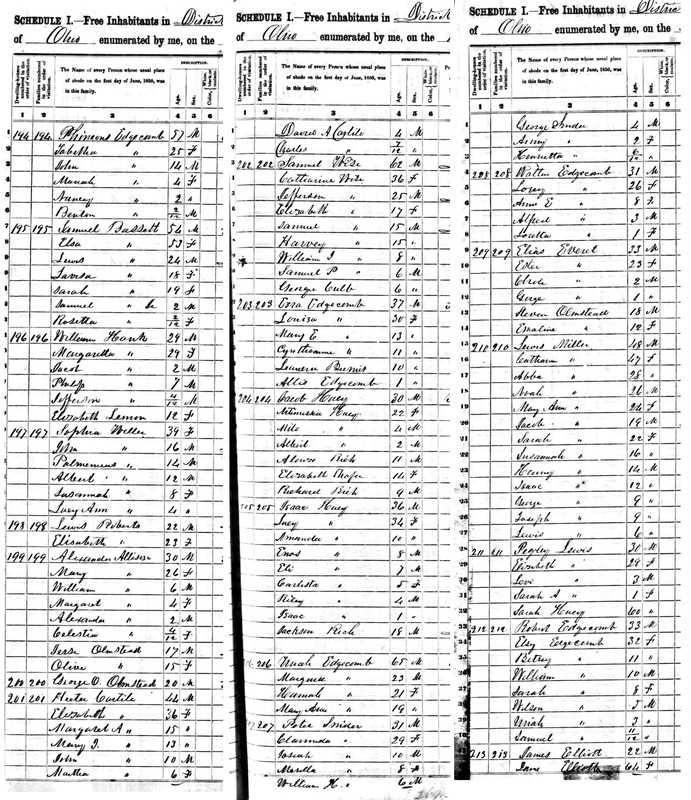 At some point this part of Bath Township became known as "Lordstown" after the township in Trumbull County from which these families came. 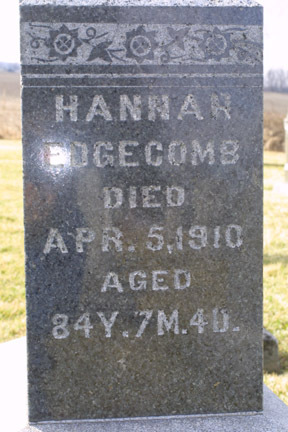 The name was in use by 1865 and continued to be used for the nearby one-room school until it was closed in about 1936. Turn left on Thayer Rd. and immediately turn right in the first driveway on the right. Stop 7. The Bassitt/Bassett homestead. 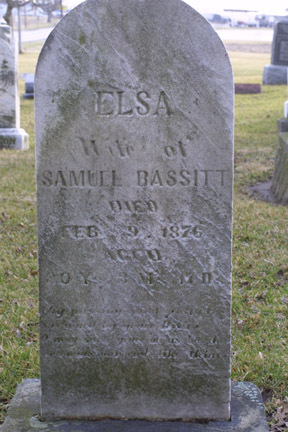 Samuel and Elsie Bassitt settled on their land southeast of the corner of Bluelick and Thayer Rd. in 1836. In 1848, their son Lewis bought the land where this house stands. 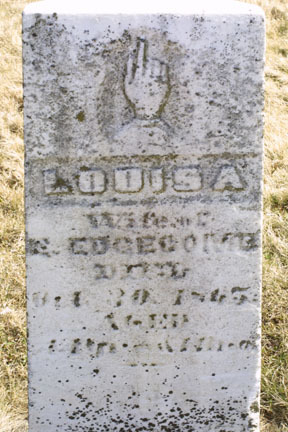 In the 1870's Lewis and his wife Sarah (Edgecomb) built the farmhouse and lived in it until Lewis died in 1902. After that it was lived in by Lewis' son Philo (pictured with his family above), Philo's son Harrison, and Philo's great-grandson David. 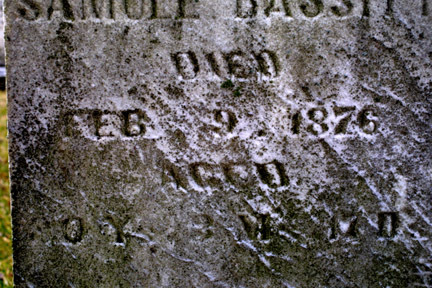 It is still owned by the Bassetts today. 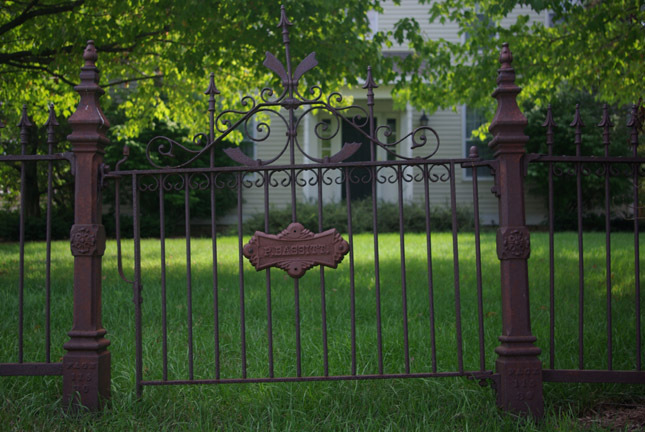 Look for Philo's name on the gate of the wrought iron fence. Take Thayer Rd. north to the Dixie Hwy. At the intersection of Thayer and Dixie was the location of the Lordstown School (now remodeled into a home) and the farm of Peter and Ellen (Baker Kollar) Snyder in the later part of their lives. Turn right and follow the Dixie Hwy. About a half mile after you turn off of Thayer Rd. 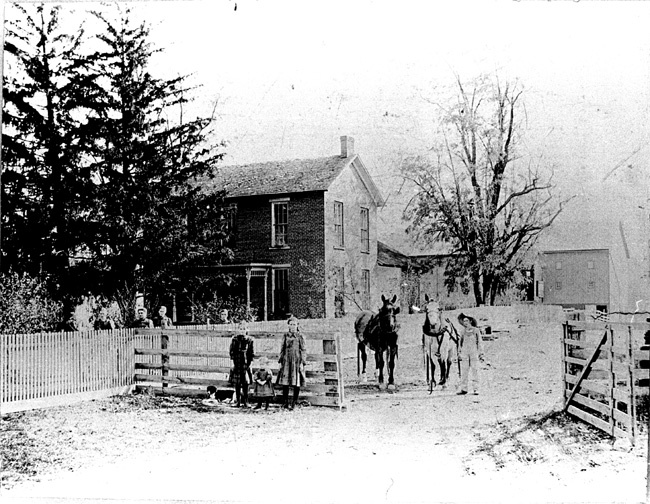 the home of Walter and Laura (Bassitt) Edgecomb still stands on the right. Continue along the Dixie Hwy. until it T's into Napoleon Rd. 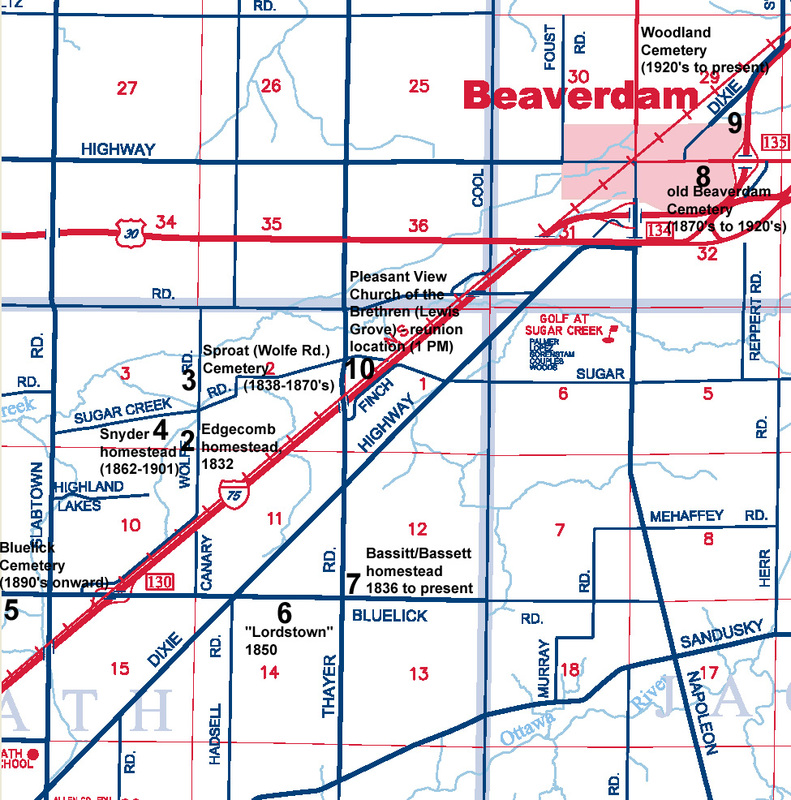 Turn left and enter the town of Beaverdam. Turn right on the Lincoln Hwy. and follow it until you see the old Beaverdam Cemetery on the right. Stop 8. 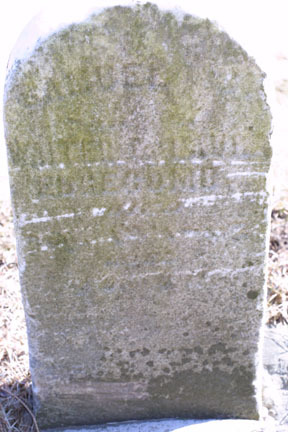 The old Beaverdam Cemetery. 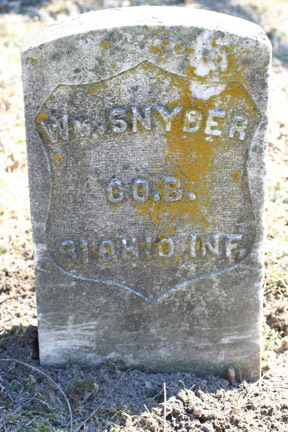 Starting in the 1870's most Bassett-Edgecomb-Snyder burials were in this cemetery. 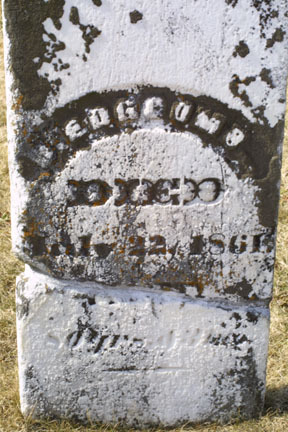 The move from burials in the Sproat Cemetery to here coincided with the move of the Disciples Church to Beaverdam in 1868. 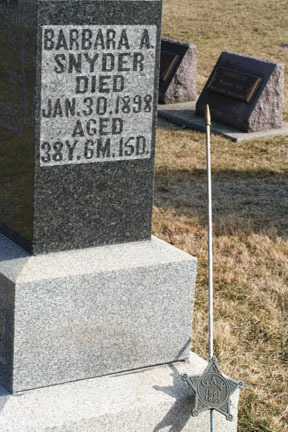 Burials continued until after 1900. From the Lincoln Highway, take the old Dixie Hwy. north out of town. The next stop is on the right as you near the Interstate. From Beaverdam, you can get back onto I-75 or you can continue on to the site of the Bassett-Edgecomb-Snyder Reunion. Return back to the Lincoln Hwy. and turn right to go west. About 3/4 mile after you cross Cool Rd. 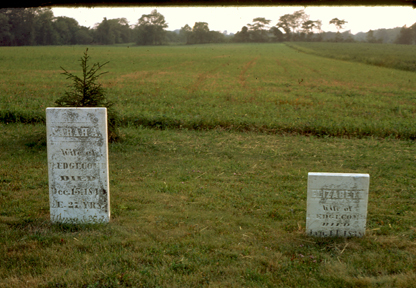 you will see the small Williams Cemetery on the right. 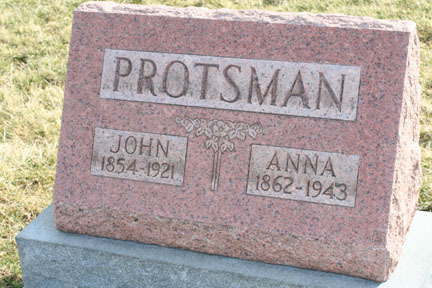 We will not stop there, but note that Nathan and Mary (Doty) Everett are buried there. 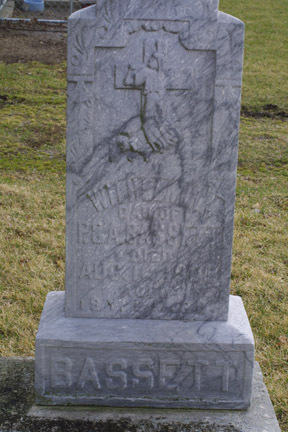 Their family came from Trumbull County and were early residents of Allen County. 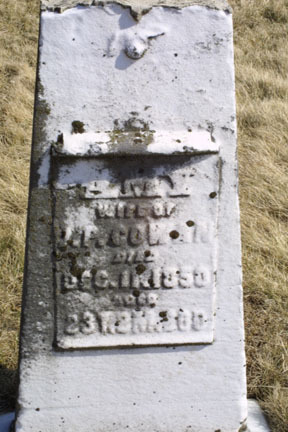 They were the parents of Elias Everett, whose daughter of Alice (Everett) Bassett married Philo, and Jacob D. Everett, whose daughter Hannah (Everett) Edgecomb, married Marquis. Turn left on Thayer Rd. 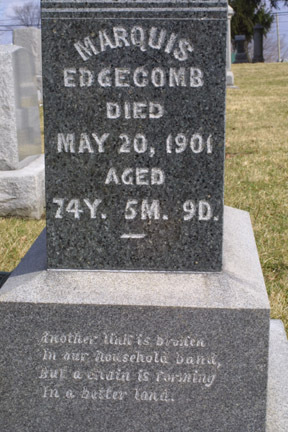 and take it 1.5 miles south to the Pleasant View Church of the Brethren, the location of the 100th Bassett-Edgecomb-Snyder Reunion as well as many other previous reunions. 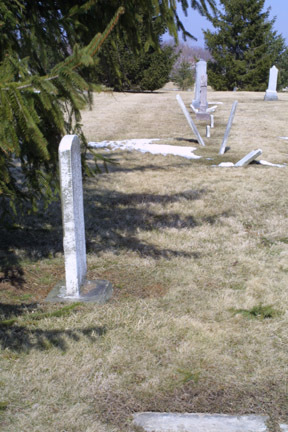 This is also the site of Lewis Grove, where the first reunion was held in 1908 before the church existed.